A comprehensive text that covers both receiver and transmitter circuits, reflecting the past decade's developments in solid-state technology. Emphasizes design using practical circuit elements, with basic ideas of electrical noise, resonant impedance-matching circuits, and modulation theory thoroughly explained. Contains the latest techniques in radio frequency power amplifier design, accepted state-of-the-art technology based on bipolar junction transistors, VMOS RF power FETs, high-efficiency techniques, envelope elimination and restoration, envelope feedback, and other newly emerging technologies. Requires a knowledge of complex algebra, Fourier series, and Fourier transforms. Also includes numerous worked-out examples that relate the theory to practical circuit applications, and homework problems keyed to corresponding sections of the text. 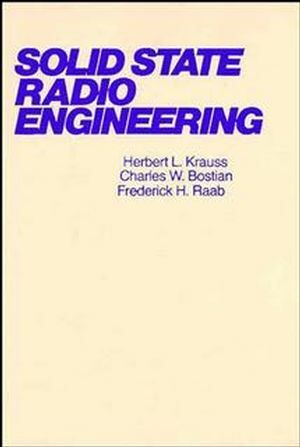 Herbert L. Krauss is the author of Solid State Radio Engineering, published by Wiley. Charles W. Bostian is the Alumni Distinguished Professor Emeritus of Electrical and Computer Engineering at Virginia Tech, USA. His students and he have made many contributions to cognitive radio, including developing the basic terminology and building some of the first working prototypes. Resonant Circuits and Impedance Transformation. CW, FN, and AM Transmitters.